Tyler Perry's Diary of a Mad Black Woman is a 2005 romantic comedy-drama film written by and starring Tyler Perry, which was inspired by the play of the same name. It is Perry's debut feature film, and the first entry in the Tyler Perry film franchise. Directed by Darren Grant, the film was released in the US on February 25, 2005. It is the only Tyler Perry scripted film not directed by Perry himself. The sequel, Madea's Family Reunion, was released on February 25, 2006. Helen (Kimberly Elise) and Charles McCarter (Steve Harris) have money, success, and a fine home. Their lives are perfect – on the surface. Charles, an attorney, is distant, verbally abusive, and has been having multiple affairs, while Helen is unemployed, bored at home, and desperately trying to make her marriage work. On the evening of their 18th wedding anniversary, Helen arrives home to find all her belongings in a U-Haul, and that Charles is kicking her out for Brenda (Lisa Marcos), his young mistress and the mother of his two sons. Helen kicks the driver, Orlando (Shemar Moore), out of the truck and visits her intimidating grandmother, Madea (Tyler Perry). Madea takes Helen in and helps her get back on her feet, to the dismay of Madea's brother, Joe (also Tyler Perry). Joe's son, Brian (also Tyler Perry), acts as Madea and Helen's attorney after Charles and Brenda catch the pair breaking into and vandalizing Charles's mansion. Because Madea is a repeat offender, Judge Mablean Ephriam places her under house arrest and sets a $5,000 property or cash bond for Helen. Brian kicks his addict wife, Debrah (Tamara Taylor), out of their home. This causes him to have a strained relationship with his daughter, Tiffany (Tiffany Evans), who wants to join the church choir. Fearing that Tiffany will turn to drugs like her mother, Brian does not allow her until Madea convinces him otherwise, encouraging him to also fix his relationship with Debrah. Helen cultivates a relationship with Orlando. Meanwhile, career criminal Jamison Milton Jackson (Gary Anthony Sturgis) asks Charles to be his defense attorney in his trial for shooting an undercover cop during a drug deal and to possibly bribe the judge in his favor. This forces the revelation that Charles received most of his money through drug deals and buying off judges. In court for divorce, Helen lets Charles keep all the money and property, provided he pay Brian's attorney fees and continue paying for her mother, Myrtle's (Cicely Tyson) stay in a nursing home since he made her place her there; Charles agrees to both terms. In the shooting case, despite Charles' efforts, the jury finds Jamison guilty. As Jamison is being led out of the courtroom, he snatches the bailiff's gun and shoots Charles in the back for failing to get him acquitted. Orlando proposes to Helen, but before she can respond, she sees the shooting on the news and goes to the hospital with Brian. They run into Brenda upon arriving. The doctor says Charles might be paralyzed for life and asks if they should resuscitate him if things deteriorate. Brenda chooses to let Charles die, but Helen, still Charles's legal wife, tells the doctor to do everything they can for him. Charles recovers, returns home with Helen, and resumes his verbal abuse of her. But Helen takes the opportunity to retaliate for years of neglect and verbal and emotional abuse. Brenda is revealed to have emptied Charles's bank account during his hospitalization and left with their boys. Their maid, Christina, has left as well because Charles has no money to pay her. In addition, all of Charles's friends and associates have turned their backs on him now that he has been left penniless. Helen and Orlando argue when he learns she has moved back in with Charles to look after him. He leaves in anger. Charles realizes his mistakes and apologizes to Helen, realizing that she was the only one who showed any true care for him. He becomes a kinder man, while she helps him recover. He regains his ability to walk one day in church, where Debrah, now clean and sober, reconciles with Brian. Charles hopes to start over with Helen, but during a family dinner, she gives him her wedding ring and signed divorce papers and tells him she will always be his friend. She finds Orlando, asks him to propose again, and accepts when he does. The soundtrack was released by Motown Records on April 19, 2005. Diary of a Mad Black Woman received mostly negative reviews. Rotten Tomatoes gives the film a score of 16% based on 112 reviews. The site's consensus reads "Tyler Perry's successful play can't make the move to the screen; this mix of slapstick, melodrama and spirituality lacks a consistent tone." Metacritic gives the film a weighted average score of 36% based on reviews from 30 critics, which the site considers "generally unfavorable reviews". Despite the negative reviews, CinemaScore reported that audiences gave the film a rare "A+" grade. Roger Ebert gave the film one out of four stars, arguing that the Madea character "is not remotely plausible [and] not merely wrong for the movie, but fatal to it." However, Ebert also wrote that Elise, Tyson and Harris offered effective performances and that "[t]here's a good movie buried beneath the bad one." On its opening weekend, the film arrived at #1 with $21.9 million. The film grossed an estimated $50.6 million in the United States and Canada with an additional $19,000 internationally for an estimated worldwide total of $50.7 million. In early 2008, playwright Donna West filed suit against Perry, contending that he stole material from her 1991 play, Fantasy of a Black Woman. Veronica Lewis, Perry's attorney, said there was no need for her client to appropriate the work of others. On December 9, 2008, the case was tried before Judge Leonard Davis in the United States District Court for the Eastern District of Texas. The jury returned an 8–0 verdict in favor of Perry. Helen and Charles have been married for 18 years in the movie, but in the play they were married for 20 years. In the play, during their divorce, Helen keeps the house and $2,000 a month, but in the movie he throws her out of the house with no money for herself. When Charles got paralyzed in the play, Helen didn't want to see him and said that he got what he deserved. In the movie, she and Brian went to see him. The characters in the play, Angelo, Willie, and Daddy Charles don't exist. Daddy Charles may exist but was put in a home prior to the movie. Joe and Miltred acted similarly. In the play, Charles and Helen make amends and get back together after he heals from his injury and learns the error of his ways. In the movie, although she forgave him, they amicably split for good and she accepts Orlando’s proposal. In the play, however, Orlando and Helen’s relationship didn’t grow as strong. 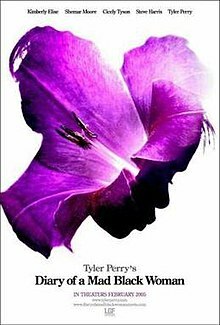 ^ a b c "Tyler Perry's Diary of a Mad Black Woman (2005) - Box Office Mojo". boxofficemojo.com. Retrieved 24 April 2015. ^ RED Interactive Agency. "Diary of a Mad Black Woman — TylerPerry.com". tylerperry.com. Retrieved 24 April 2015. ^ "Diary of a Mad Black Woman (2005)". Rotten Tomatoes. Retrieved 2009-05-20. ^ "Diary of a Mad Black Woman : Reviews". Metacritic. Retrieved 2009-05-20. ^ "Cinemascore :: Movie Title Search". cinemascore.com. Retrieved 9 August 2015. ^ "Actor Tyler Perry Found Not Guilty In Copyright Lawsuit". KSLA. Retrieved 2009-06-17.